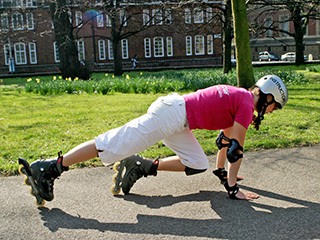 New for the summer, SkateFit classes are a unique combination of strength and resistance training alongside speed and technical skating skills. Whether your goals are to lose weight and tone up or to improve your speed, stamina and skating skills, this class has it all. Classes will be comprised of circuit style workouts using your own bodyweight, and some resistance equipment, as well as working on skills that will improve your balance, co-ordination, speed and power. All this on skates! Suitable for all abilities and led by Hazel, a Level 3 qualified Personal Trainer and Level 1 ICP Skating Instructor, the only prerequisite is that you can already skate, stop and turn on your own. All exercises will be scaled to each individual’s ability with progressions to help you reach that next level in your fitness and skating skills.